Having won the Sankalp 2010 award in the Clean Energy Sector with the TLUD biomass gasifier stove, Servals is pleased to announce the introduction of its next contribution to rural cooking energy – Servals Wood Stove. This is a simple wood stove that shows high thermal efficiency, is low smoke and provides superior user convenience. With other products such as the kerosene burner, kerosene stoves, hybrid cooking stoves, TLUD biomass gasifier, Plant Oil Stoves and Lamps already in the portfolio, Servals is indeed happy and proud to offer its wood stove as an improved cookstove solution towards improving the quality of life of the biggest chunk of the biomass cookstove users. We sincerely believe that this wood stove will go a long way in improving the rural cooking energy spiral at all levels – user, community and planet. The key focus is to design a simple natural draft woodstove that is low-smoke, fuel efficient and does not require constant flame monitoring. Stable Flame; no need to monitor : The Servals woodstove is designed with a flame stabilizer arrangement built into the fuel-wood stand. This is a modified grate that keeps the charcoal burning with a brilliant reddish white color by allowing a small quantity of pre-heated primary air to move up through it. The fuel-wood stand also reduces "smoke levels" and "fuel consumption". The fuel-wood stand is provided as an option item. Superior Flame Quality : The Servals woodstove is designed with a flame concentrator at the top. This brings the flame towards the centreline of the stove thereby improving the stove performance and flame quality. User convenience: The Servals woodstove is designed such that the charcoal bed is kept sufficiently hot to ensure a stable flame. There is no need to blow air manually into the flame at any point of time. 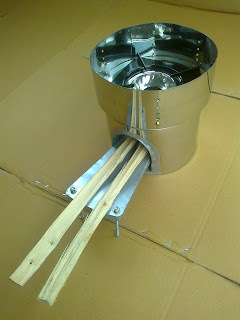 Adjustable Pot Skirt : The Servals woodstove is the only stove that comes with an adjustable potskirt. A potskirt protects the flame from mild wind movements and also improves the thermal efficiency of the stove. The adjustable feature – a one of its kind design – enables the same potskirt to be used for various cooking appliances like tawas, frying pans, pressure cookers and different types of vessels. Low Smoke Stove : The Servals woodstove is designed to be a low smoke stove when operated upto its rated fire-power of 2 KW. Adequate firepower : The Servals woodstove is designed to provide a 2 KW fire power which is optimal for domestic cooking. Aligned with cooking culture: The Servals woodstove is very easy to use. It is just like a regular woodstove that dominates the biomass cookstove market, just easier, less smoky and doesn’t require any change in cooking behaviour or biomass sizing. Easy Maintenance: The Servals woodstove is very easy to maintain. Just clean the stove before use, by removing the left-over ash and any charcoal. Wiping the stove with a dry cloth is all that is needed to keep it clean and neat. Better to use and store the stove in a dry place. Durability : The Servals woodstove is designed to be durable. The stove body, pot-skirt, fuel-wood stand and flame concentrator are made out of stainless steel. Vessel support is made out of mild steel. Saving in fuel cost : Servals wood stove will save fuel due to better thermal efficiency and flame concentration. Indoor Air Pollution: Significantly reduces emissions. Climate Change: Reduces net addition of CO2 into the atmosphere; No net addition of CO2 into the atmosphere if only twigs ( or other biomass residues ) are used. 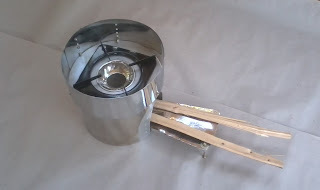 The Servals woodstove is very simple to use. It is just like a frequent woodstove that rules the biomass cookstove marke. wood burning stoves may keep you warm and cozy in the shivering cold of winter, but they may also be hazardous to your health, especially if you have certain health conditions that place you among those in a high risk group. So be careful when you’re using it. Wood stoves aren't just available as a heating option since there are also variations like this which offer a great way to cook delicious food! Excellent wood stove! I hope it's save our money and our life. Thanks..wood furnaces Buy a Greenwood wood boiler that saves 70% on your home heating bills. We offer the world-class wood gasification heating appliances on an affordable budget.